In the first part of the beginner's guide to Angular tutorial series, you learnt what components are in Angular 4 and how to write Angular components. In this part of the tutorial series, you'll learn what services are in Angular and how to use them. In an Angular application, components deal with presenting the data to the view. Fetching data for the components to display is handled by Angular services. Since the data fetching portion is handled separately in Angular services, it makes it easier to mock test services. Components shouldn't fetch or save data directly and they certainly shouldn't knowingly present fake data. They should focus on presenting data and delegate data access to a service. In this tutorial, you'll see how to create an Angular service for fetching data for an Angular component. Another advantage of using Angular services is that it makes it easier to share data between two separate components. In this tutorial, you'll be creating a word component which would search the query word entered by the end user against an API and return the search result. You'll be making the API call by using an Angular service. 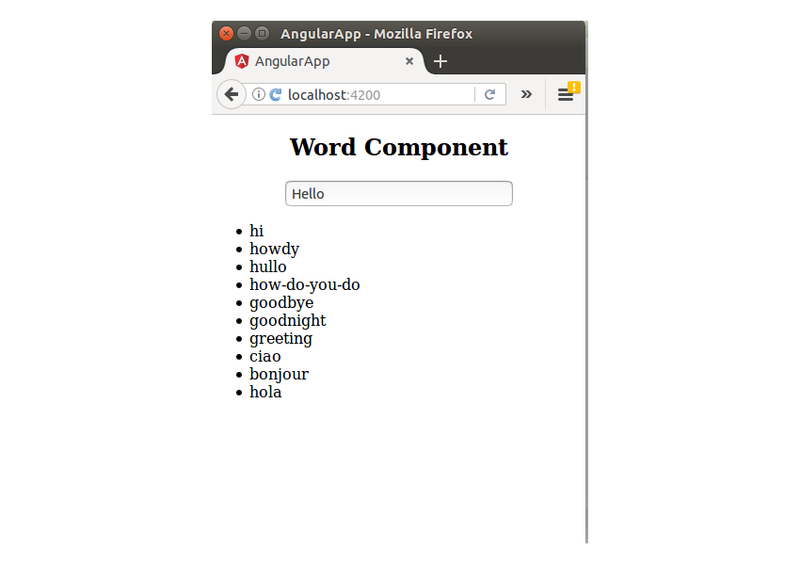 So let's get started by creating an Angular component. Navigate to the project directory and create a folder called word. As seen in the above code, you just created the WordComponent class which would control the word.component.html template file. It has a @component decorator where you have defined the selector using which it would be accessible, the templateUrl, and the component styleUrls. Once you have created the component, you need to add the component class to the NgModule. Open the app.module.ts file inside the src/app directory and import the new WordComponent. Save the above changes and restart the server. You should have the word component displayed when loading the application. Let's create an Angular service to query the word against a service URL which would return synonyms of the word. You'll be using the Datamuse API for querying a keyword. Create a file called word.service.ts inside the src/app/word folder. You'll be using the @Injectable() decorator to make the service class available for injection. Import the Http module inside the word.service.ts file to make API calls. You'll be making API calls to the following URL. You need to append the query keyword along with the above URL to get a maximum of 10 synonyms of the query term. Define the variable url inside the WordService class and initialize it inside the constructor method. You have declared and initialized the http variable, which you'll use while making API calls. Now that you have the word service ready to make the API calls, you need to define the WordService as the provider in the WordComponent. Import the WordService in the word.component.ts file. Define the providers in the Angular WordComponent. Initialize the WordService inside the constructor method. Define a method called search inside the word.component.ts file which would call the service method. Inside the search method, subscribe to the search_word method from the WordService. Add the enter key press event to the input element in the word.component.html file. After entering a query term when the user presses the enter key, it would make a call to the search method in the word.component.ts file. As seen in the search method inside the word.component.ts file, you are collecting the response inside the words variable as a list. 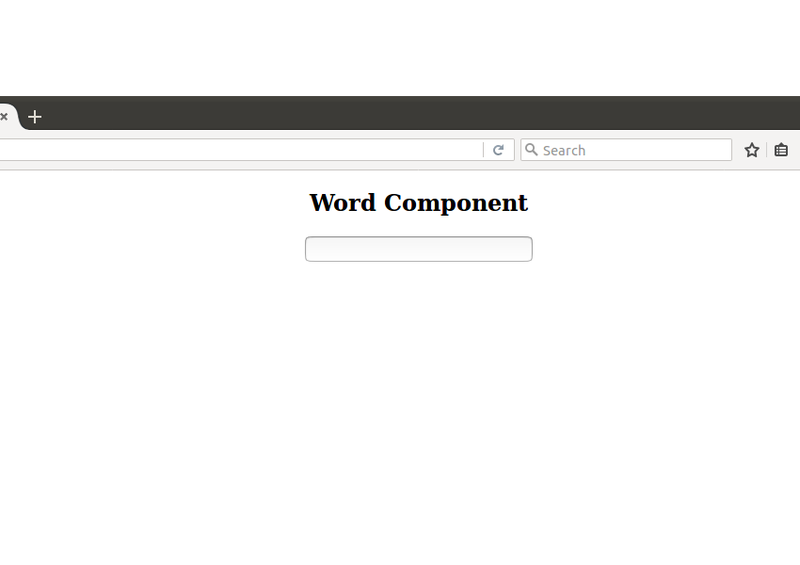 So let's iterate the words list and display in the word.component.html file. Save the above changes and restart the server. Enter a keyword and press the enter key, and you should have the result populated as a list. In this tutorial, you learnt what Angular services are. You learnt how to create Angular services and use them from an Angular component. You created a Word component which queries the entered keyword against an Angular service and displays the returned data in the component template file. How was your experience learning Angular services? Do let us know your thoughts and suggestions in the comment section below.